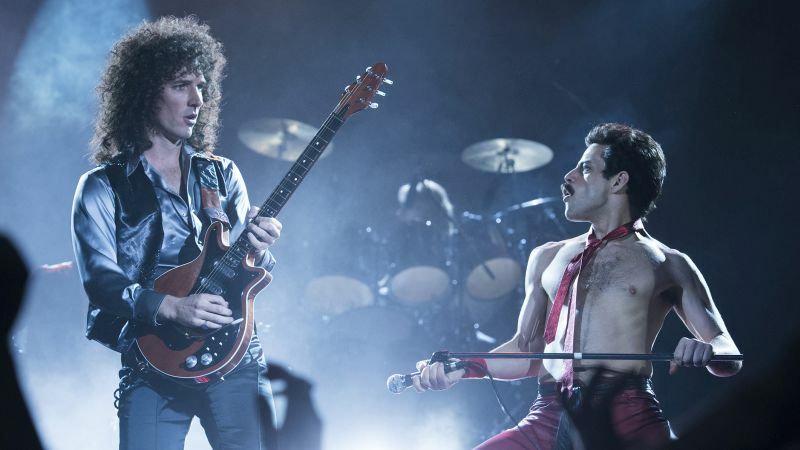 Early on “Bohemian Rhapsody”, which was directed by Bryan Singer before he was fired (and who has more serious problems that should effectively end his career) and replaced by Dexter Fletcher, makes a compelling argument against itself. 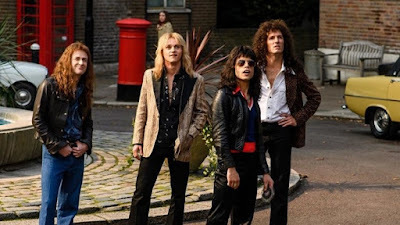 This happens when its subject, British band Queen and its flamboyant, mercurial frontman Freddie Mercury (Rami Malek), meets record executive Ray Foster (Mike Myers), a composite of real life music bigwigs, who argues vehemently against the band yearning to use the confounding symphonic epic giving the movie its name as a second album single, preferring the simplistic “I’m In Love With My Car.” Foster loses the battle, of course, because, as this scene makes clear, he has no vision. The irony is awe-inspiring, swearing by the exact sort of singularity the film itself consistently fails to engender. You could take this scene word for word, shot for shot and plunk it down in Jake Kasdan’s 2007 “Walk Hard” which satirically tore the musical biopic limb from limb, and which no one involved in “Bohemian Rhapsody’s” making apparently consulted, and it would play as comedy. Both movies open in the future at their respective musicians’ most famous live shows – Cash’s at Folsom Prison, Queen’s at 1985’s Live Aid. Yet “Walk the Line” views its moment through the prism of Cash and June Carter, suggesting how it frames it story through their fraught courtship, whereas “Bohemian Rhapsody’s” ultimately comes across as a shameless attempt to – paraphrasing McKee – get ’em with the ending. Why “Bohemian Rhapsody” even imagines a band break-up prior to Live Aid to up the all-important Stakes. True, this fake disbanding, instigated by Mercury’s visions of further grandeur, are also meant to make a case for the band as family and family coming first. But this metaphor, like everything else, is drawn transparently, as is the parallel to Mercury’s own troubled family life, which feels cut and pasted from a 70s sitcom, right down to the laugh track you here in the background from a sitcom on TV as a young Mercury tells off his Dad. And so even if the whiplash editing is meant to evoke the “cabaret-style drama and performance art ingenuity” that the Rock ‘n’ Roll of Fame cites in Queen’s bio, it mostly comes across as a frazzled attempt to distract. These familial rifts and reconciliation run parallel to Mercury’s sexual awakening. If he initially falls for and becomes engaged to Mary Austin (Lucy Boynton), a fashion shop assistant who aids his stylistic endeavors, he eventually suspects he might be bi-sexual though the film plays incredibly coy with this discovery. Perhaps this is because Mercury struggles to open up to himself, but even when he seems to, the movie remains oddly incurious about his self-discovery, as if frightened of ruffling certain viewer feathers. It’s a bit akin to “Colette” which aesthetically buttoned up its protagonist’s changing sexual desires. Then again, “Colette” at least dynamically presented her straight lover whereas Mary, despite the best Boynton can do, is never as interesting as the character, who stayed close to Mercury throughout his life, suggests, gradually becoming less an untraditional confidant than an almost matronly presence. If Mercury is flattened out, Malek at least imbibes much necessary flamboyance, particularly in the early-going where he plays the frontman not so much overconfident as sort of swaggerlingly prophetic. And though his overbite might be overdone, his frequent little snigger is not, communicating the character’s lurking insecurities far more than any rote monologues in the rain (I see you, Donald Kaufman!). In the musical performance scenes, meanwhile, he struts with great purpose even if it cannot help but feel like anything more than impersonation. 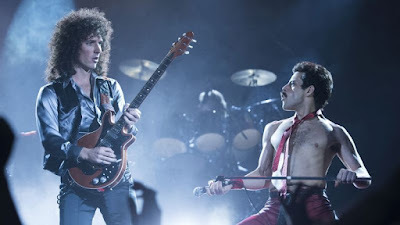 If the real Mercury sought communion through performances, as performers often do, this becomes one of the movie’s overriding points, explicated in the sequence where Brian May (Gwilym Lee) dreams up “We Will Rock You.” Yet the song’s performance opts for colorless cuts between the band onstage and rows of feet stomping, evoking noise rather than communion, while the crowd shots in the climactic Live Aid performance feel as if they were shot on a different day than the fictional Queen’s performance, severing the supposed bond, reducing it to the recreation it is. The music's great, sure, of course, but that’s why YouTube exists.